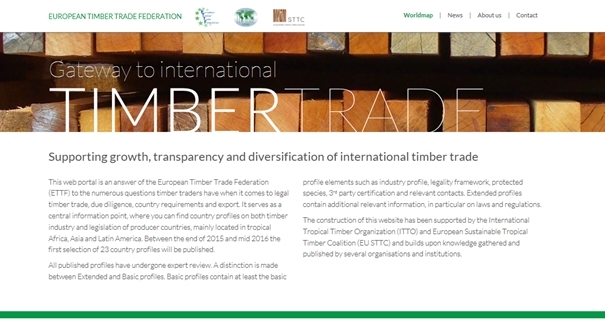 The website ‘Gateway to international Timber Trade’ (www.timbertradeportal.com) has been launched by the European Timber Trade Federation (ETTF). International timber traders will find here a one-stop information point for forest industry information, legal timber trade, country requirements and export from timber producing countries. The overall objective is to enhance and facilitate legal trade in tropical timber. In recent years importers of tropical timber have had to adjust to new and challenging terms of trade, in particular due to the verification of the legality of wood products to be traded and their origin. To satisfy the due diligence requirements of various regulations, importers must obtain documentary evidence to show that the supplier is operating in accordance with national laws and regulations. Therefore it is essential that tropical timber importers can access supplier country legislation and regulations. With the launch of this website, importers around the world have ready access to such information. The construction of this website has been supported by the International Tropical Timber Organization (ITTO) and European Sustainable Tropical Timber Coalition (EU STTC) and builds upon knowledge gathered and published by several organisations and institutions. The coordination and compilation of profiles is done by Form international, a Dutch consultancy firm specialised in forest and plantation management and certification. Information on industry and legality has been gathered from several available sources, such as the FAO and ITTO databases, and data from ITC / Tradecom. Furthermore an extensive contact network of experts, sources and traders has been developed behind the scenes, to give input, review and keep the website up-to-date. This is the first time information sharing and exchange is organised and centralised on such a scale, which will ultimately result in more transparency of the timber supply chain. The selected countries are all timber producing countries, with high importance or potential for foreign markets. Now the new platform is ready, country profiles will be added and uploaded stepwise. The first profiles already published on ETTF’s website are the ones of Ghana, Guyana, Ivory Coast and Indonesia. All published profiles have been reviewed by at least one expert party. The next profiles to be expected are Brazil, Viet Nam, Suriname, Cameroon, Republic of the Congo and the Central African Republic. Remaining countries on the list, to be published before mid-2016, are India, Myanmar, Malaysia, Papua New Guinea, China, Democratic Republic of Congo, Gabon, Liberia, Peru, Ecuador, Honduras, Russia and Ukraine. Other countries can be added if they supply information. Visitors of the website are also invited to add information or share their experiences, using the review button on the country profiles. Also, Form international can be contacted directly if you have important contacts or sources that would enhance the completeness and quality of the profiles. info@forminternational.nl.